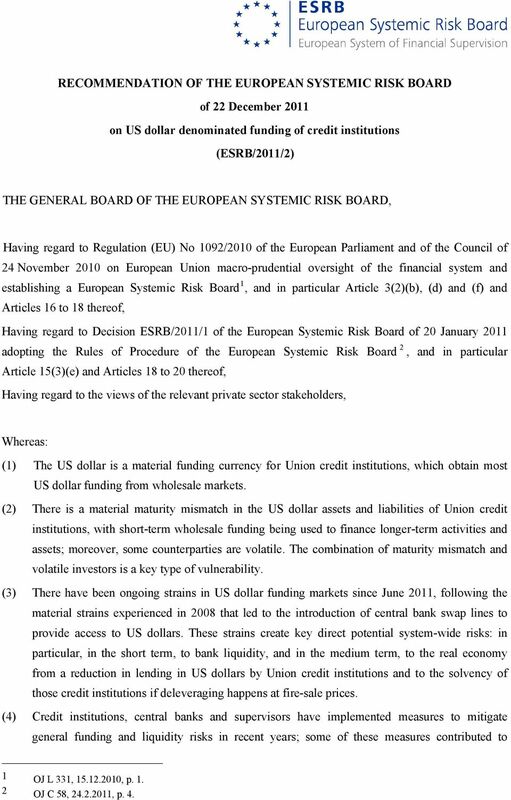 Download "RECOMMENDATION OF THE EUROPEAN SYSTEMIC RISK BOARD of 22 December 2011 on US dollar denominated funding of credit institutions (ESRB/2011/2)"
1 RECOMMENDATION OF THE EUROPEAN SYSTEMIC RISK BOARD of 22 December 2011 on US dollar denominated funding of credit institutions (ESRB/2011/2) THE GENERAL BOARD OF THE EUROPEAN SYSTEMIC RISK BOARD, Having regard to Regulation (EU) No 1092/2010 of the European Parliament and of the Council of 24 November 2010 on European Union macro-prudential oversight of the financial system and establishing a European Systemic Risk Board 1, and in particular Article 3(2), (d) and (f) and Articles 16 to 18 thereof, Having regard to Decision ESRB/2011/1 of the European Systemic Risk Board of 20 January 2011 adopting the Rules of Procedure of the European Systemic Risk Board 2, and in particular Article 15(3)(e) and Articles 18 to 20 thereof, Having regard to the views of the relevant private sector stakeholders, Whereas: (1) The US dollar is a material funding currency for Union credit institutions, which obtain most US dollar funding from wholesale markets. (2) There is a material maturity mismatch in the US dollar assets and liabilities of Union credit institutions, with short-term wholesale funding being used to finance longer-term activities and assets; moreover, some counterparties are volatile. The combination of maturity mismatch and volatile investors is a key type of vulnerability. (3) There have been ongoing strains in US dollar funding markets since June 2011, following the material strains experienced in 2008 that led to the introduction of central bank swap lines to provide access to US dollars. These strains create key direct potential system-wide risks: in particular, in the short term, to bank liquidity, and in the medium term, to the real economy from a reduction in lending in US dollars by Union credit institutions and to the solvency of those credit institutions if deleveraging happens at fire-sale prices. 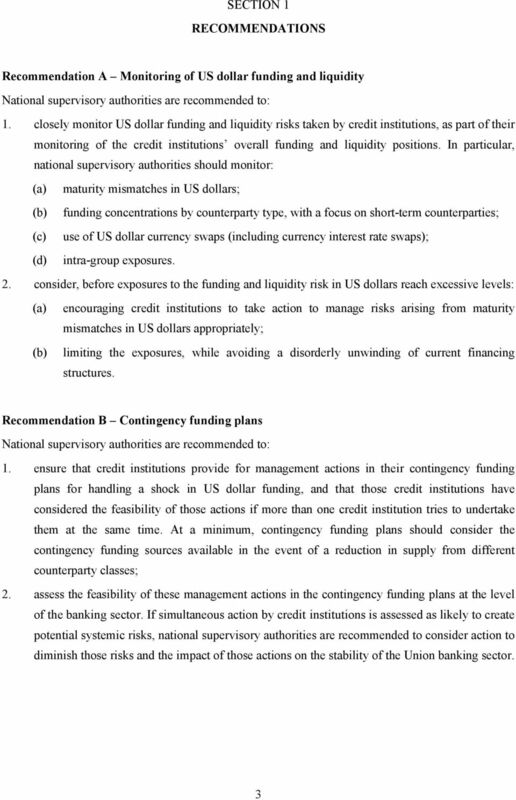 (4) Credit institutions, central banks and supervisors have implemented measures to mitigate general funding and liquidity risks in recent years; some of these measures contributed to 1 OJ L 331, , p OJ C 58, , p. 4. 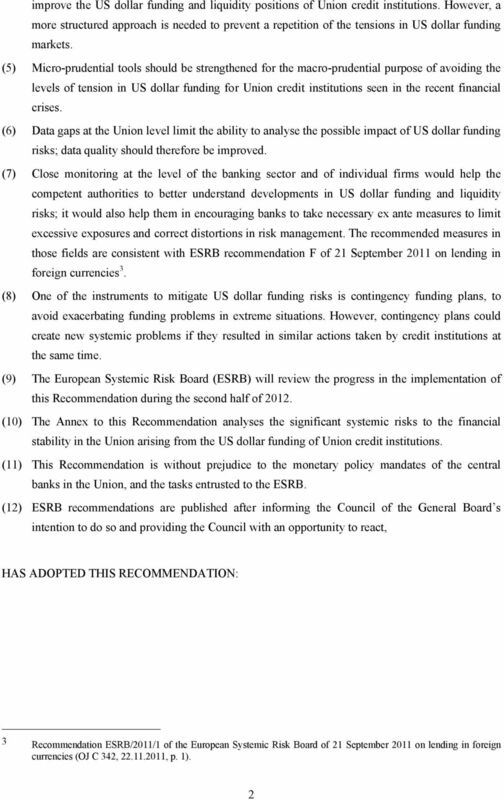 Delegations will find attached the draft Council conclusions on a Capital Markets Union, as prepared by the Economic and Financial Committee. 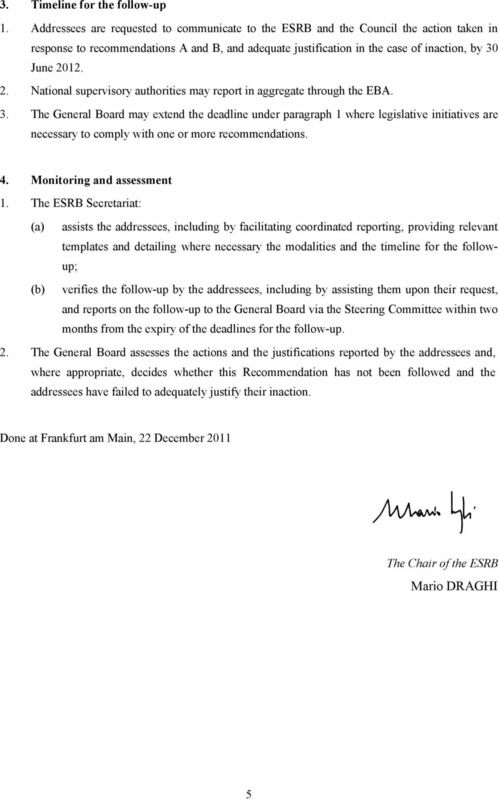 EIOPA-BoS-14/259 28 January 2015 Final Report on Public Consultation No. 14/017 on Guidelines on own risk and solvency assessment EIOPA Westhafen Tower, Westhafenplatz 1-60327 Frankfurt Germany - Tel. Guidelines. on harmonised definitions and templates for funding plans of credit institutions under Recommendation A4 of ESRB/2012/2. 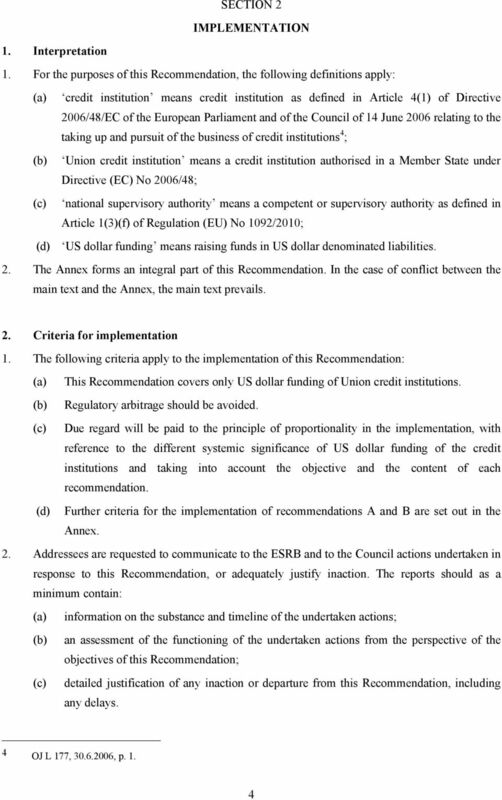 Delegations will find attached the general approach as adopted by the Council (Economic and Financial Affairs).